The Ninja Line is tailored to today’s cleaning professional who desires quality equipment. You can choose from several models of the Ninja Warrior Carpet Cleaning Machine equipped from 150 to 500 PSI and optional availability of internal heaters (1850W). A dual parallel, bypass vacuum motor system is incorporated into an optimized manifold to generate more CFM producing faster carpet drying times! The Ninja delivers the best ratio of optimized heat, vacuum power and pressure for non-stop high performance cleaning without worry of blown circuits, each of the dual power cords require only 15 amps. Quickly go to your job, set up and work! 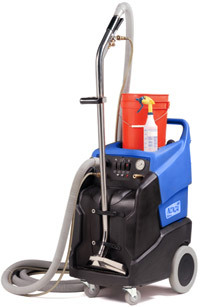 Each Ninja Warrior Carpet Cleaning Machine allows you to carry a 5 gallon bucket and has quart sized bottle storage on top of the recovery tank as well as a wand tray on front of machine so that you can carry more into the job on one trip. We all want to be as non-intrusive to our customers and keep them happy. The Ninja’s new vacuum motor exhaust muffler design allows for less noise while you are cleaning making your customers even more happy from not only a great carpet cleaning but also happy that you did it more quietly than other carpet cleaners. Each Ninja has bottom access to all motor and vacuum components making it easy to maintain and repair. This design also minimizes exposure to the motor and vacuum from water or solution.